Racemap streams your sports event live on the Internet, smartphones and Facebook. Spectators, friends, family and colleagues can watch you race - live. After the event you can watch the recorded race as replay. Download the free Racemap » App for iPhone or Android. Test the Live Tracking now. The Racemap for your event supports Live Tracking already. Inform your family, friends and colleagues, that they can watch you race. Racemap supports many sharing channels like Facebook, WhatsApp, Email, SMS. Fully charge your battery before the race. Start Live Tracking 10 minutes before the start of your event in the Racemap » App and stow your smartphone safely. Close all apps that you do not necessarily need. For many competitions you can freely join live tracking with Racemap » App. However, for some events the organizer or the team captain invites you to Live Tracking. For some events you can purchase a tracking option and activate it in the app with a supplied key. If you have been invited for live tracking with a key (six characters) or if you have received a specific key while booking the competition. 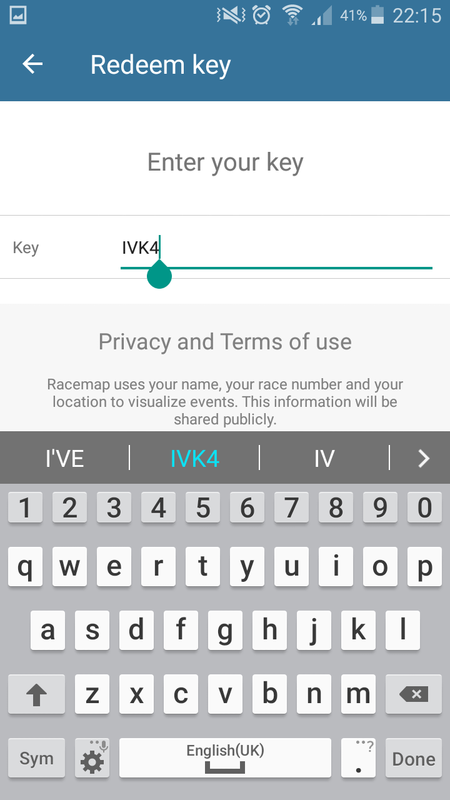 Press “Redeem Key” in Racemap » App. Type in the key directly into the Searchbar. Correct or add your (nick)name and race number. Press "Enable Live Tracking". Live Tracking is supported immediately. That way you can test the tracking right now. Are you visible in the live stream? You may also activate tracking in your app with the activation link. For that, Racemap » App needs to be installed on your phone. On your phone: Tap the activation link in the invitation email or from your booking confirmation. Choose to open the link with Racemap » App. Correct or add your name and race number. Press "Enable Live Tracking". Live Tracking is supported immediately. That way you can test the tracking right at the moment. Are you visible in the live stream?